COSTA DE SON VANRELL - Villa for 5 people in Montuïri. Enjoy the silent surrounding in a beatiful country house with pool in Montuiri which offers a nice holiday home for 5 people. 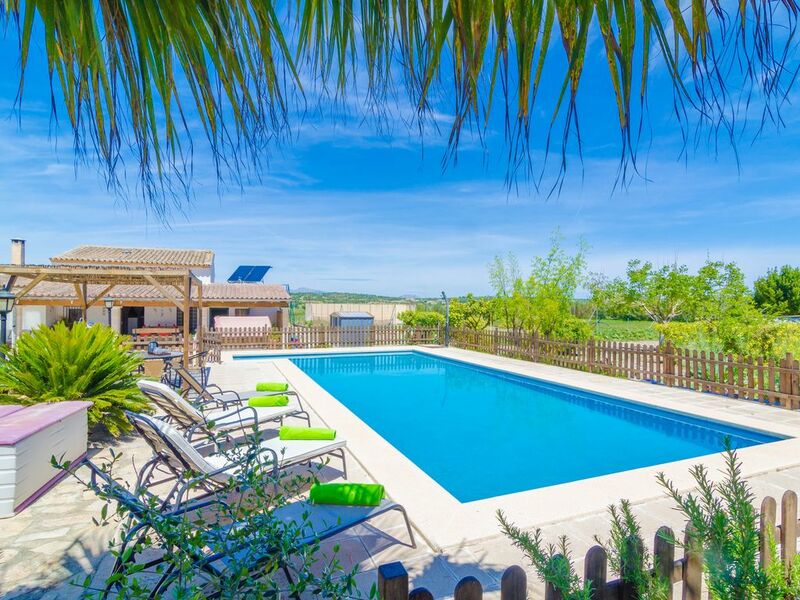 In this beautiful rustic but modern house you will enjoy the country atmosphere of the interior of Mallorca but being really close to everything. The really big impressive chlorine pool of 12 x 5 meters with a depth of 0.7 to 1.9 meters is surrounded by a beautiful terrace with several sun loungers for enjoying the sun. This part is fenced from the rest of the terrace. An ideal place for families with small children. Several tables and hammocks invite to relax close to the furnished area with sofas and old restored rockers from where to enjoy the sunset, and a rustic and original table in which to eat or dine outdoors the delicious dishes cooked in the barbecue that is to your provision. There's a ping-pong table, a basketball basket, a trampoline and a sauna for relaxing after practicing sports. The whole plot of 3400 m2 is completely fenced, and although there are some neighbors in the surroundings, you can enjoy your privacy. The whole house is distributed on one floor. From the magnificent porch you access directly to the interior of the house that unites in the same space living room and kitchen. The current rustic style continues in the interior, in a space with wooden beams and stone walls. This area has satellite TV, Wi-Fi connection and air conditioning. It has a dining table for six people that is located next to the kitchen area, which has ceramic hob and is equipped with everything you need for preparing excellent meals for your loved ones. It also has a table with four chairs to have breakfast comfortably. You will sleep in three bedrooms, all on the same level. Two have a double bed and the third has a single bed. All bedrooms have air conditioning, and all with wardrobes or dressing room. You will find two bathrooms with shower to serve the whole house. You will also find a washing machine, iron and ironing board. For the youngest ones we can provide a baby cot and a children highchair on request. Montuiri is a small town in the center of Mallorca that is close to all points of the island. You can find medieval vestiges and great landscapes where you can enjoy the tranquility of the countryside. In the village which is 2 kms away you can find the basic services as well as some shops and restaurants. The nearest beach is sa Rápita at 30 kms. For additional expenses please contact the advertiser. There is outdoor parking for 2 cars open air and 2 covered parking spaces. Great villa and perfect for a relaxing holiday away. The local town is a 7 minute drive and has a supermarket and a few restaurants/bars. Pizzeria es poli is at the top of the hill with stunning views and excellent food and service - make sure to visit! Not much within walking distance but perfect if hiring a car. Lots of activities at the villa including a tennis court, all equipment provided. Hosts were extremely friendly and helped us sort out taxis back to the airport. Would strongly recommend securing accurate directions though as the location isn’t on (Hidden by Airbnb) maps or gps. The co-ordinates work, or ask the host for the nearest road that is in (Hidden by Airbnb) maps (a few mins away) and directions from there. Overall a lovely villa and great for a peaceful holiday and would definitely return. Schönes Haus mit viel Platz, sehr sauber und einem unkomplizierten Vermieter. Wir kommen gerne wieder. Vielen Dank für Ihre Bewertung. Wir freuen uns, dass Sie sich im Haus so wohlgefühlt haben. Wir würden uns freuen, Sie im nächsten Jahr wieder im Haus Costa de Son Vanrell willkommen zu heißen. Beste Grüsse, Villafinca. ARRIVAL AND DEPARTURE: CHECK-IN: after 4.00 pm CHECK-OUT: before 10.00 am The following check-in and check-out times can be adapted to your needs (where possible). Please contact the agency in time. On your arrival the owner of your holiday house will await you in order to hand over the keys of the property. If you arrive after midnight (12.00 am) a fee of 50€ may be charged.